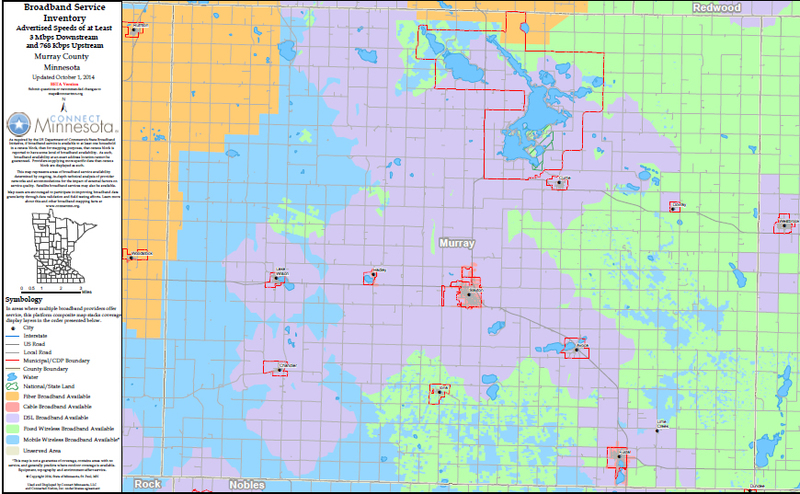 A provider in metropolitan Hennepin County currently pays about $.50 per Megabit to connect to the Internet backbone; the average cost of three providers in rural Pennington County is $15.33 per Megabit to connect to the Internet backbone. Making the situation more challenging for all providers, there is a great discrepancy in the number of potential customers in Hennepin County versus Pennington County; population density in Hennepin County is 2,081.7/sq. mi and in Pennington County it is 22.6/sq. mi. Median income (2009-2013) also differs: in Hennepin County it is $64,403 and in Pennington County it’s $45,633. For these reasons and more, the business case for offering broadband in Pennington County Falls is far more challenging than in Hennepin County. Using Pennington as the example also demonstrates that while it’s tougher to make a business case, clearly someone has. Pennington is better served that many other counties. Pine County is sitting at less than a quarter coverage. But they are working on better coverage. Pine County is actively working to pursue better broadband as a partner in the East Central Broadband Initiative. They were part of the East Central Broadband conference in April 2014; the conference is planned primary by community leaders and attended by community leaders, member and providers. One topic that came up was talking about broadband as a utility. At the Dec. 17 city council meeting, MidContinent Communications announced that it plans to bring “gigabit internet” to the Pine City area by the end of 2017. The new service is 35 times faster than the national average and five times faster than MidContinent’s current top speeds. 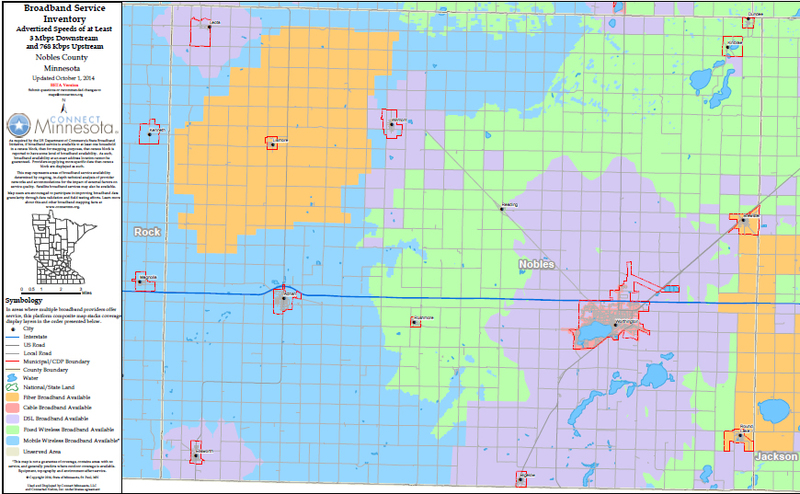 Otter Tail Telcom, Stuart Lake.Awarded $105,364 to expand existing infrastructure to bring fiber-to-the-home service to 47 unserved locations, including 46 homes and one business near Stuart Lake, just north of State Highway 210 and east of Fergus Falls (between Clitherall and Vining). Total project costs are $210,729; the remaining $105,365 (50 percent local match) will be provided by Otter Tail Telcom. Community and Economic Development Impact:Fergus Falls calls itself the “telework capital of Minnesota.” This project will continue the build-out in and around Fergus Falls to make that goal a reality for a growing number of people living, working, and operating and/or starting businesses in the Fergus Falls region. Otter Tail Telcom, 245th. Awarded $108,553 to serve the northeastern outskirts of Fergus Falls near 245th Street. The project will expand existing infrastructure to bring fiber-to-the-home service to 39 unserved locations, including permanent residences and work-from-home employees. The total project costs are $217,105; the remaining $108,553 (50 percent local match) will be provided by Otter Tail Telcom. They are also part of an award in Stevens county. As the description states, Fergus Falls and the surrounding area have been focusing on becoming the Telework Capital of Minnesota. They received national recognition for their efforts in 2013 when they were named a smart community. (The have a great telework handbook if you’re looking at telework in your community!) Extending the reach of FTTH home will help extend the telework opportunities to a wider audience. But Otter Tail is more than telework. In 2014, received almost $500,000 for Otter Tail County Public Health to implement e-health programs. Otter Tail Telcom has been looking for support to extend their network. They sent in rural experiment ideas to the FCC in 2014. Back in 2013, CenturyLink opted to received Connect America Funds (CAF) to serve parts of Otter Tail County. It will be fun to see what funding does for the area. Clearly Olmsted County is one of those rare places where wireless access makes a big difference – a 40 percent difference! And that wireless boost is fairly new. Back in 2013, Olmsted and Winona Counties were some of the least served in the area – with less than 20 percent coverage. Also in 2013, CenturyLink reported that they would be getting CAF funding to better serve at least portions of Olmsted County. And they have been working with Dakota County on better infrastructure. So movement is being made, they just need more of it. And once/when they have it, Olmsted County knows what to do with technology. 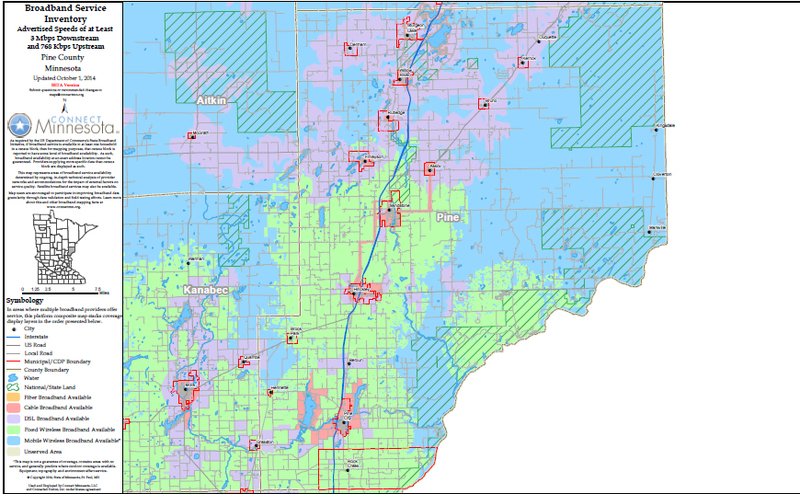 Despite less than stellar connectivity, Olmsted was named third top digital county (for smaller county in the US) by the Center for Digital Government’s Digital Counties and the National Association of Counties. 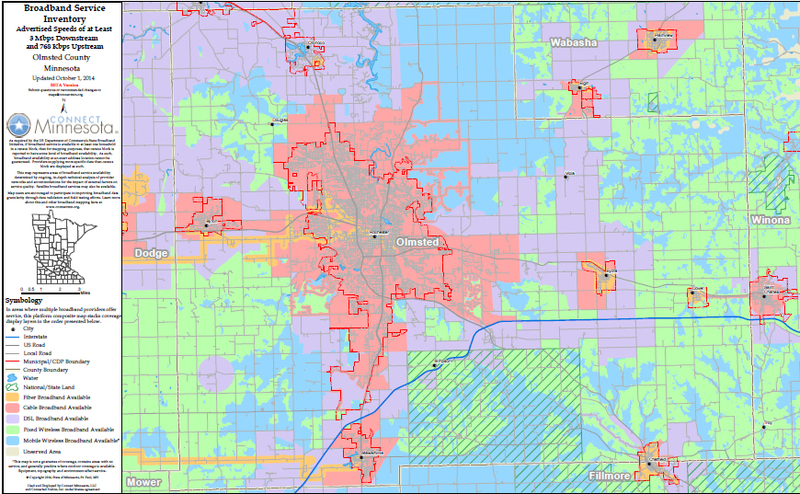 Norman is a county of haves and have-nots. 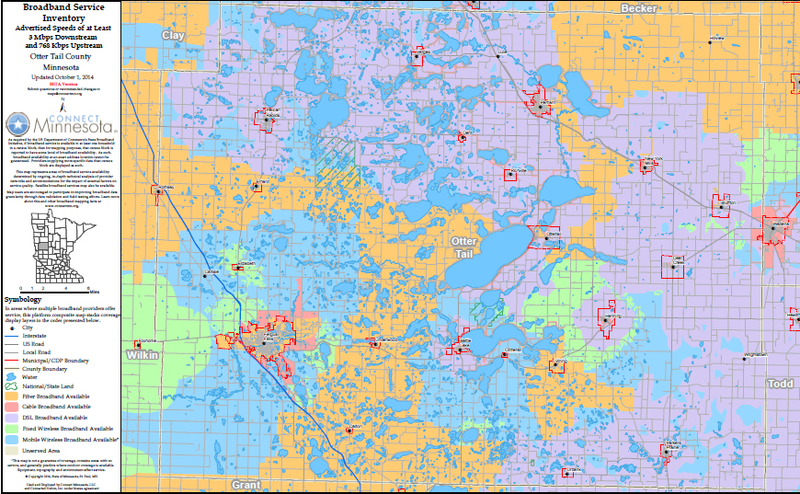 In 2010, the FCC listed Norman County as one of the least served counties in Minnesota. Thanks to an ARRA-funded project awarded in 2011, part of the county is now well served. So they are no longer one of the least served, but at 61 percent they are still in need. But then, broadband service revolutionized the way we did business. We went from hoping for $40,000 in sales to having $1 million within reach by the end of 2015, and from one part-time employee to 12 full-time employees with the intention of hiring eight more. We do business in 56 countries and are planning to build a new $500,000 facility to accommodate our growth. Over the years, we’ve had to painfully decline business partnerships because of Ada’s broadband limitations. I was on an island in the digital world, which limited my company’s ability to keep growing. Last year, my husband and I were heavily courted by North Dakota to relocate our business to where high-speed broadband service was guaranteed. We wanted to stay in our town, but also knew that without high-speed internet service, our company would not survive. Not long after, our community received the attention of a local phone company recognized the need to move forward installing fiber so that our businesses and residents can prosper here. If we had not received the commitment for higher broadband speed, we would not have achieved our dream goals. So they clearly understand the need and they clearly have local providers who are willing to support the local economy – at least in parts of the county. As agricultural producers, this project may not directly affect broadband access at your farm. However, it is intended to benefit you in two direct ways. First, providing opportunities to create new jobs may help your kids, or even yourselves, stay in Rural Minnesota. More and more farm families have to have off-farm employment to survive, not to mention providing options for spouses. 2. Second, creating additional demand for broadband will help providers offer the latest and greatest telecommunications services that you do directly need—from video cattle auctions to simple social media. When we help each other out in rural Minnesota, everybody wins. Some efforts have been made. In 2013, Mediacom made upgrades in the area and CenturyLink signed on for CAF funding for the area. But clearly more needs to happen.